They look like something found in sunken ship, inside the treasure box. Like something that pirates wore. They are watches made by the boutique French brand called Romain Jerome. 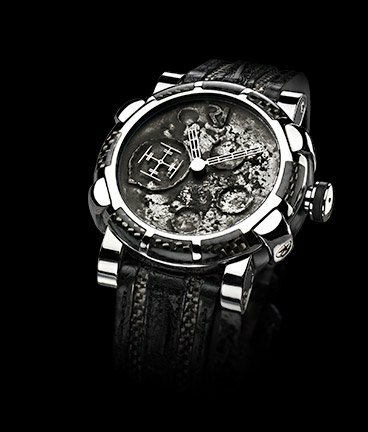 Jerome achieved fame in the watch world when he launched his Titanic DNA collection, a series of watches that are partly made from stabilized rusted steel sourced from the infamous Titanic. The creativity and horological know-how behind these watches is incredible. Romain takes materials like rust and coal and now moon dust and coats the bezels and dials of his watches with them. The collection is called Moon Dust – DNA and there are four models: the Gold Mood, Steel Mood, Black Mood and Steel with gem-set diamonds. Each model is produced in a limited series of 1,969 pieces. The Steel Mood (as pictured here) has a case crafted from finely polished stainless steel and a bezel made from tiny fragments of carbon fiber found on the Apollo XI spacecraft. The strap is partially composed of materials gathered from an ISS spacesuit and is connected to the case with signature Romain Jerome lugs – lugs that are capped with star screws. It’s the dial that’s especially impressive and magical. Made from a mineral composite, including real fragments of material found on the moon, it genuinely looks like the moon’s landscape and gives a three dimensional sense of craters. The RJ logo is found at the 12 o’clock position and small seconds are indicated at the 9 o’clock position by a metal structure. The hour and minute hands are made to look like sun sensors found on space crafts that are sent to the moon. This watch runs on a caliber from the specialty firm Concepto and has a power reserve of 42 hours. This watch, as with the others in the Moon Dust – DNA collection is water resistant to 50 meters. In addition to using actual moon dust in his watches, Romain Jerome also employs rust and graphite (the chemical name for coal). These materials and application techniques are a first in watch-making and are used to give the watches a dark, magical look that makes it look as though it really did come from a sunken treasure.